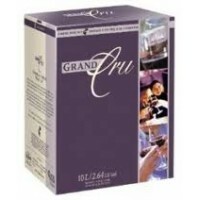 RJ Spagnols Grand Cru International Australian Cabernet SauvignonNew 12 Liter kit PLUS GenuWine Cab..
RJ Spagnols Grand Cru Merlot A smooth rich red wine, medium-dark in color, tasting of blackberry ..
A dry wine with overtones of green melon leading to a crisp, clean finish. 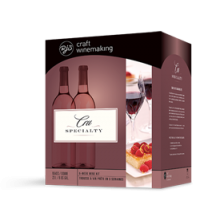 A bouquet of honey and he..
RJ Spagnols Grand Cru Johannisberg Riesling A delicate flavored wine which offers a slight tartne..
RJ Spagnols Grand Cru Pinot Noir The soft texture and dark color complement the flavors of berry ..
Toasted Caramel Dessert Wine Intensely creamy and pleasantly sweet, this full-bodied dessert wine..
Fruity in aroma and clean in taste. A crisp, dry wine that’s pleasant in its youth. 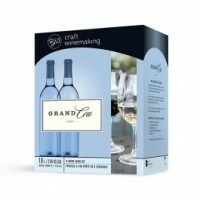 Perfect fo..
GRAND CRU Pinot Blanc Style Rich, light-bodied flavour and slightly herbal aroma. 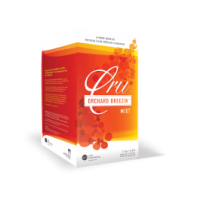 Subtle under..
GRAND CRU VerdicchioHerbal aromas dominate the bouquet, while flavors of lemon and pear entice th..
CRANAPPLE CELEBRATION This low alcohol white wine features tart green apples balanced out by smooth..